Posted on Tue, Mar 27, 2012 : 5:55 a.m. Note: This story has been updated to reflect the correct Willow Run Board of Education meeting date for Thursday. 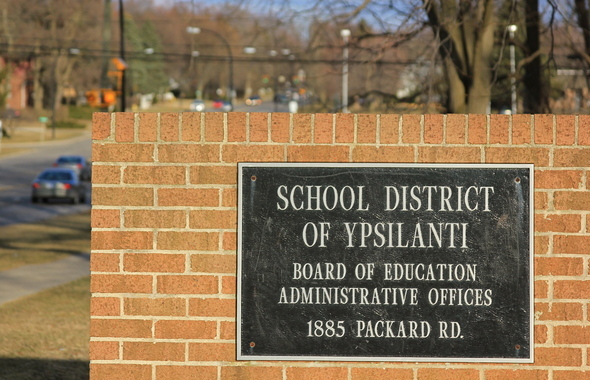 Ypsilanti Board of Education trustees unanimously voted to continue discussions about merging districts with Willow Run Community Schools at Monday’s Board meeting. Board members will attend a joint meeting with the Willow Run Board of Education on April 16 in the Ypsilanti Township Civic Center at 7 p.m., provided Willow Run Board members vote to continue the discussion at their meeting on Thursday. Several Board members emphasized before voting that the April 16 joint meeting would continue discussions about consolidating the districts, not to put any plan in action. Bates said attendees of the joint meeting can look forward to hearing discussion about what a new district could look like being rebuilt from the ground up how it could benefit students. It was announced last Tuesday that the two districts, aided by the Washtenaw County Intermediate School District, would consider consolidating into one district. The Willow Run and Ypsilanti Collaboration and Communication Task Force recommended the decision. Officials from both districts said last week the merger could prevent an emergency manager situation and improve student achievement. The task force voted to place the consolidation proposal on an upcoming ballot, predicated on the development of a “solid, detailed unification plan with specific legislative and financial initiatives in place to support it,” said Scott Menzel, superintendent of the WISD, at last week’s meeting. Bates said while no decisions have been made, the board only has the power to recommend a consolidation and that the final say will come down to the voters in the community. He said it’s too early in the process to tell when it could reach the ballot box. The process will be transparent and board members from both districts consider the public’s opinion crucial in moving forward, said Trustee Linda Snedacar-Horne. According to Bates, if the community does vote for the consolidation, the WISD would appoint the Board of Education members for the new district, which would then select a superintendent. Tue, Mar 27, 2012 : 4:54 p.m.
&quot;According to Bates, if the community does vote for the consolidation, the WISD would appoint the Board of Education members for the new district, which would then select a superintendent.&quot; So the YPSI and WR superintendents get to skate to greener pastures in some other district and we will hear once again&quot;Be patient as we rebuild&quot; This is getting old. Tue, Mar 27, 2012 : 8:12 p.m. If they consolidate they could vote WISD out and hire an independent to come in and take over transportation and what ever else to keep the budget on track. This is going to take 2 years to become solvent again. If they ever do. Can't wait to see how the chips fly and land. Tue, Mar 27, 2012 : 4:19 p.m. If they form an all-new district with all-new schools and an all-new board, then there will be no history for emergency management, NCLB, MEAP, etc. WISD will have free reign of the district for the first few years, hopefully they know what they're doing and don't waste a good opportunity. On the other hand, they could make a few bad hires (like two former WR superintendents), contract out all services to WISD &quot;management&quot; and kill any chance for a speedy recovery. Without competent management, this could end up far worse than a state takeover. WISD should keep the state involved in order to bring the best resources to bear on the problems. Tue, Mar 27, 2012 : 2:07 p.m. I heard they will probably call themselves Ypsilanti Consolidated. I am not sure how else they are going to configure the rest. If an emergency mgr does come in. The mgr will probably reconfigure everyone else as well. Can we say massive lay offs? This is a win win for both sides. Wed, Mar 28, 2012 : 2:12 p.m.
WR already has larger classrooms. The teachers that are already laid off or going to be laid off have no say unless something else can be done about it. The win win thing is for WR and YPSI not for those who are going to loose their jobs if they do need to lay off. The district wins, but not for the staff that might loose their jobs. I see a lot of privatization in this thing. Won't be pretty either. Wed, Mar 28, 2012 : 3:07 a.m.
How is laying off teachers and forcing larger classrooms a win for any of the sides? Tue, Mar 27, 2012 : 12:20 p.m.
Bring on the Emergency manager. This is an Ypsi takeover. They are in much worse shape than Willow Run. Tue, Mar 27, 2012 : 10:22 a.m. The new district should be called West Ann Arbor School District. Tue, Mar 27, 2012 : 4:22 p.m. It would be nice to get it right the first time around!